New study in The Oncologist supports the use of blood-based tumor DNA (liquid biopsies) in hepatocellular carcinoma (HCC) to facilitate personalized medicine. The CureMatch decision support platform matches personalized drug combinations for liver cancer patients. 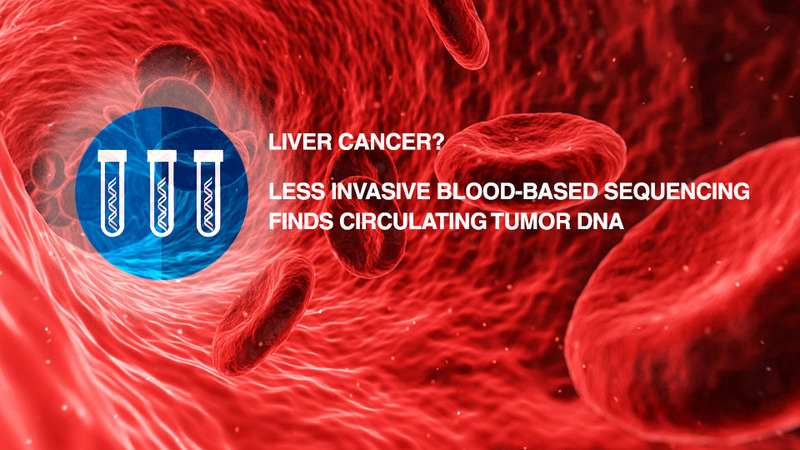 SAN DIEGO, CA – March 26, 2018: A new cancer study reports that next-generation sequencing of circulating tumor DNA (ctDNA) can provide therapeutically actionable genomic analysis in hepatocellular carcinoma (HCC). This is significant as liver malignancies are difficult to tissue biopsy especially due to increased bleeding risk. In order to improve treatment options, this study aims to offer clinical validation of the utility of somatic alterations identified in blood-derived ctDNA of HCC patients. Hepatocellular carcinoma, also known as hepatoma, accounts for approximately 75% of all liver cancers and is the third leading cause of cancer deaths worldwide, approximately 800,000/year. HCC is generally diagnosed based on imaging. In the United States, HCC is the fastest growing cause of cancer mortality overall (Surveillance Epidemiology and End Results, SEER, program), and most cases of HCC are a result of cirrhosis of the liver due to alcoholism or infection from hepatitis B or C. There is only one systemic therapy approved by the U.S. Food and Drug Administration, Sorafenib, which has demonstrated an overall survival benefit of 2.3-2.8 months. Unfortunately, the median overall survival for advanced HCC is less than one year. There is a clear need to develop new treatments for this disease. (c) facilitation of serial testing to track disease progression over time. Conducting molecular analysis allows for the selection of anti-cancer drugs specifically matched to genomic alterations found in a patient’s cancer. The study evaluated 14 advanced HCC patients via digital ctDNA sequencing of 68 genes. All 14 patients were found to have alterations, ranging from one to eight with a median of three, and several specific gene mutations were identified. No two patients had identical genomic portfolios, suggesting the need for customized treatment. Based on the next-generation analysis, 79% of patients were determined to have theoretically actionable alterations. Two patients who received matched treatments on the basis of the ctDNA results showed evidence of improvement. These two patients are described in detail in the study. The authors of this research seek to advance personalized medicine in cancer care. Standard oncology is limited to therapies that have experimental justification, even if those treatments have not shown significant longitudinal success. Biopsy-free testing accelerates clinical research of precision medicine, and there has been a recent explosion of genomic and proteomic research driving drug design and development. As the genomic landscape of oncology is being established, ctDNA analysis in conjunction with computational modeling of drug interactions offers actionable insights to oncologists. Two of the article’s authors, Dr. Igor F. Tsigelny and Dr. Razelle Kurzrock, are founders of CureMatch® a digital precision oncology company bridging the gap between legacy cancer treatments and advances in personalized medicine. The CureMatch intelligent computing system assists oncologists with the daunting task of selecting the most promising combinations of anticancer drugs for each patient. Utilizing proprietary algorithms to analyze over 4.5 million combinations of commonly used as well as newly approved cancer treatments found in massive pharmacological and clinical archives, CureMatch scores and ranks Personalized Combination Therapy® options to target specific molecular aberrations and improve the precision of cancer treatment recommendations. In a constantly changing field, oncology and hematology professionals must stay at the cutting edge of new diagnostic and therapeutic advances for the benefit of their patients. To that end, The Oncologist® is dedicated to translating the latest research developments into the best multidimensional care for cancer patients. Thus, The Oncologist is committed to helping physicians excel in this ever-expanding environment through the publication of timely reviews, original studies, and commentaries on important developments.